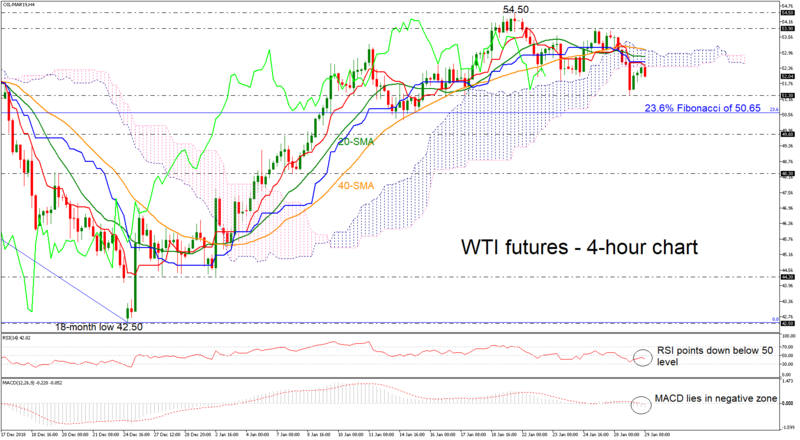 West Texas Intermediate (WTI) futures have declined beneath the 20- and 40-simple moving averages (SMAs) in the 4-hour chart, indicating possible negative retracement. Momentum signals are bearish as well, as the red Tenkan-sen line, which is below the blue Kijun-sen line, looks to be heading south, while the RSI has reversed lower, holding beneath its 50 neutral mark. Also, the MACD oscillator lies in negative zone with stronger movement than before. Should the price continue this downward rally of the last session, the next support level for investors to have in mind is the 51.30. Slightly below this area, the 23.6% Fibonacci retracement level of the sharp downward movement from 76.90 to 42.50, around 50.65 could attract attention ahead of the 49.80 inside swing support zone, taken from the high on January 7. On the other side, if the oil heads higher it could find nearby resistance at the 20- and 40-SMAs around 52.80 and 53.09 respectively. Further up, the price could rest around the 53.90 resistance and if there is a successful break above this barrier, the one-and-a-half-month high of 54.50 could be another pause for traders. To sum up, oil futures returned back below the near term SMAs and the bias seems to be neutral to bearish at the moment. A decline below the 23.6% Fibonacci would switch the medium-term outlook back to negative. On the other side, a jump above 54.50 would open the way for bullish actions.